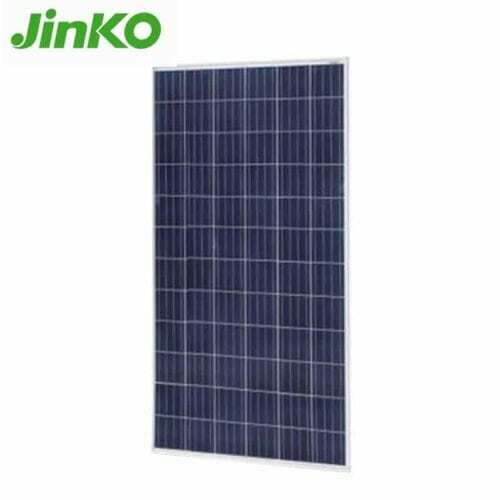 The Jinko 325W Eagle Poly Silver Frame Solar Panel is the perfect panel for project where you need to squeeze out the maximum power from a limited space. JinkoSolar (NYSE: JKS) is a global leader in the solar industry. JinkoSolar distributes its solar products and sells its solutions and services to a diversified international utility, commercial and residential customer base in China, the United States, Japan, Germany, the United Kingdom, Chile, South Africa, India, Mexico, Brazil, the United Arab Emirates, Italy, Spain, France, Belgium, and other countries and regions. The company has built a vertically integrated solar product value chain, with an integrated annual capacity of 3 GW for silicon ingots and wafers, 2.5 GW for solar cells, and 4.3 GW for solar modules, as of December 31, 2015. JinkoSolar also sells electricity in China, and had connected approximately 1,006.6 MW of solar power projects to the grid, as of December 31, 2015. JinkoSolar has over 15,000 employees across its 5 productions facilities in Jiangxi and Zhejiang Provinces, China, Malaysia, Portugal and South Africa, 12 global sales offices in China, Spain, the United Kingdom, the United Arab Emirates, Jordan, Saudi Arabia, Egypt, Morocco, Ghana, Brazil, Costa Rica and Mexico and 11 oversea subsidiaries in Germany, Italy, Switzerland, the United States, Canada, Australia, Singapore, Japan, India, South Africa and Chile. Join our ZERO Home Bills Community. BEST Products from the BEST Brands at BEST Prices for ZERO Home Bills on ZEROhomebills.com by Solaranna.